The Australian Turfgrass Conference and Trade Show is an important event for everyone in the turf industry. While the trade show offers valuable exposure for companies and professionals, the seminars and workshops offer vital information for delegates to take away to their respective businesses. Jacobsen believe education is an imperative part of conferences and events, as it is a beneficial tool that will help the industry to grow and move forward. 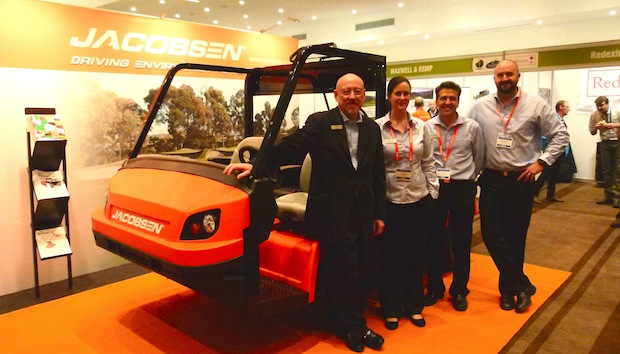 This year’s turfgrass conference saw the return of the AGCSA Jacobsen Workshops for a third year in a row. The full day event runs on the Monday; the first official day of the event, and it has become more and more popular each year. The workshop focuses on both agronomic and management aspects of the industry that cater to the sportsfield and golf industry scopes. After the success of 2014, Jacobsen brought back Keystone Training speaker David Bancroft-Turner. At last year’s turfgrass conferece, David’s session was fully booked, and this year was no different. Covering the management side of things, David’s talk focused on the topic of Political Intelligence. He gave insight into surviving, thriving and managing the politics at a club. As a co-director of The Academy for Political Intelligence, it’s no wonder David’s advice can breed great results. His attention is not on breaking down workplace politics, but instead using them in a positive way within an organisation, or in this case – at a sporting club. Taking charge of the agronomic sector was Dr. Jack Fry, a Professor in the Department of Horticulture, Forestry and Recreation Resources at Kansas State University. Having taught and conducted research in turfgrass science for more than 20 years, Dr. Fry is definitely an expert in the industry, and one to learn a lot from. Dr. Fry’s topic this year for the Jacobsen sponsored workshop was Stress Management Strategies for maintaining quality turf. After Australia’s summer season, Dr. Fry’s turf management session provided great insight to delegates and attendees from the industry, and information they can implement into their own maintenance plans. Supporting and sponsoring educational events is incredibly important to the Jacobsen name, as it provides opportunity for industry leaders and workers to learn and grow not just in their own personal development, but their respective organisations as well. This forward thinking from Jacobsen helps create a ripple effect that sustains our industry as it goes from strength to strength.